I ran out of time today. I want to do a little tutorial from this book. There are interesting directions for picots. Things I haven’t seen elsewhere. Maybe I haven’t thought to look in the more common crochet books, since it shows things I have never needed before. The instructions show how to crochet picots on each side of a chain. That means the picots can face down. There are also directions for crocheting picots on the side of a treble crochet stitch, which can be used on a stitch of any height. This is the first book I have come across that calls for picots pointing in all different directions. It may be a few days before I get back to this. I have another one-to-one class at the Apple store to learn the new computer. There are still some things I still need to prepare for that in the morning. I also have to think about the best way to show the steps involved in forming the picots off the side of a treble stitch. Maybe make a storyboard before I photograph each step. Something to think about anyway. 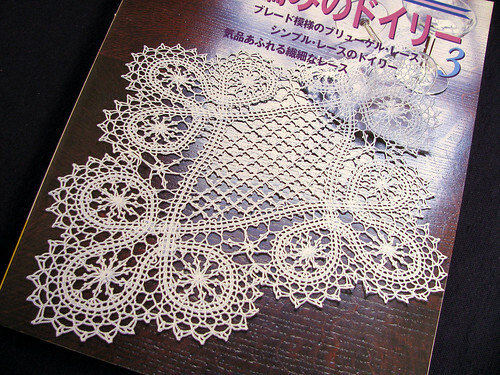 This entry was posted on Thursday, February 19th, 2009 at 3:00 am and is filed under Crochet and Doily. Tagged: Book, Crochet, Doily. You can feed this entry. You can leave a response, or trackback from your own site. Wow, that pattern on the cover of that book is very pretty!